I have pulled together all the seed packets I think my #SeedyPenpal will like. They have all been packaged up and posted to Kay, who will hopefully nurture them through the year and will be reward with a plentiful harvest. Now I just need to be patient whilst I await my parcel from #SeedyPenpal Karen. 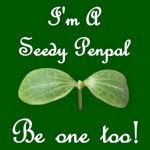 Find out more about Seedy Penpals. You are good, I'm posting mine out next week. It is fun taking part & I hope you get a lovely package back.